We awoke to this gorgeous morning on Saturday. I love Fall and the crisp hazy days that it brings. I wanted so badly to get out and go for my morning run (funny that I'm dying to do the thing that put me in this state) and then hit up some farmers markets. But elevating my ankle on the porch would have to suffice for an outdoor activity this Saturday. I'm still homebound aside from my wonderful co-worker Janelle coming to pick me up for work each weekday. After letting me complain about my lack of mobility for a while on Saturday morning The Don convinced me it was time to buck up enjoy my downtime while it was around. Good advice. To cheer me up Don invited some friends over for dinner and we spent the day watching movies and coming up with dinner ideas. We finally decided on Vegetarian Pot Pie and mashed potatoes since we were both in the mood for comfort food. Don got to it in the kitchen and, after lots of hard work, pulled from the oven a beautiful golden pot pie. The apartment was full of the smell of buttery flaky crust and perfectly cooked vegetables. He set it on the stove top and started cleaning the kitchen in anticipation of our friends arrival in a few minutes. It was at this moment that a loud glass shattering sound came from the kitchen. 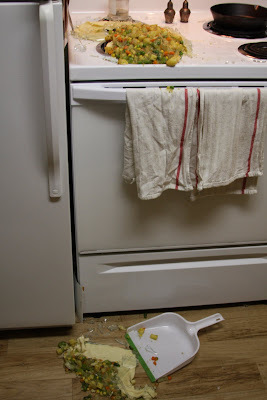 I jumped up and hobbled to the kitchen to find pie innerds and glass everywhere. Don had accidently turned the stove top burner just past Off to High after cooking the potatoes and the pie dish did not like the heat. I looked up to find the most devistated look on Don's face and at that very moment the buzzer for our buildings front door went off. We had a good laugh with our friends when they got upstairs, cleaned up, and ordered some pizza. What can you do? Plus, we had a delicious dessert to divert our attention. Don's Rustic Blueberry Tart was a total success. Simple flavorful ingredients; crust, blueberries, and fresh creme to pour over. It rivaled my beloved Peach Blueberry Kettle Tart from Black Bottle in Belltown. 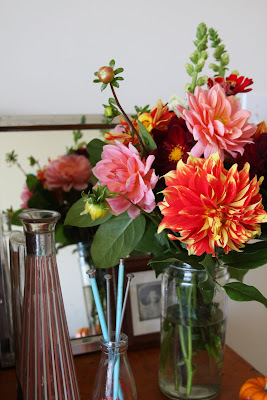 Sunday morning while I read Don headed out for a walk and returned with dahlias, my favorite! The days of $5 flower bouquets from the Broadway Farmer's Market are numbered. I'm going to miss them this winter. Breakfast was not that of champions but it was delicious. 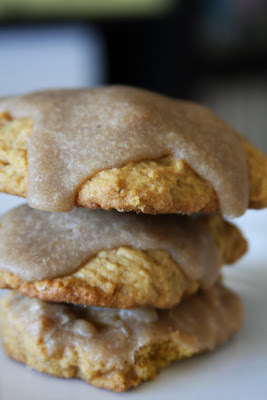 Don experimented with a couple pumpkin cookie recipes with maple frosting and after eating a few we just never got around to breakfast. Later in the day we were were still dying for the pot pie that was taken away from us so off Don went to the store to gather up the ingredients again. A couple of hours later this masterpiece emerged from the oven. Mushrooms, peas, carrots, green beans, potatoes and field roast "meat"loaf filling.